The government has said it accepts a report's recommendation that the Royal Mail should be part-privatised. The study by Richard Hooper says new minority owners can offer the "confidence, experience and capital" needed to carry out vital changes. Describing the current Royal Mail as "untenable", the report adds that the universal service is under threat without modernisation. Dutch firm TNT said it would be interested in a stake in Royal Mail. TNT said in a statement that further steps depended on the full implementation of the government's proposals, including changes to regulation and the government paying off much of Royal Mail's company pension liabilities. "Assuming the UK government implements these recommendations, I think that exploring a strategic partnership with Royal Mail makes a lot of sense for both our companies," said Peter Bakker, TNT chief executive. Some analysts also said German postal operator Deutsche Post could become a potential partner for the Royal Mail. Meanwhile, ministers insist the Royal Mail will remain "publicly owned". The report's findings were presented by Business Secretary Lord Mandelson, who confirmed that the government agreed with its recommendation that the service be part-privatised. 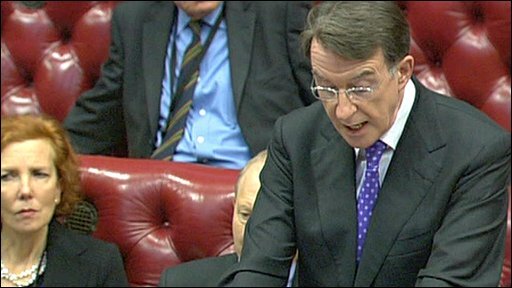 Lord Mandelson added that the government also agreed with its second recommendation that the government take over responsibility for reducing the mail service's pensions deficit. Mr Hooper, a former deputy chairman of media watchdog Ofcom, found that as a result of new communication technologies such as e-mail, the Royal Mail had missed out on a potential £500m of profits over the past year. The study said that Royal Mail needed to modernise urgently, and introduce more automation. Regarding its pension deficit, the report said Royal Mail was having to top up the fund by £280m a year, describing the deficit as "large, growing and volatile". The Royal Mail's pension deficit was £3.4bn in 2006, but is widely thought to have doubled since then. The report recommended that the government should take over responsibility for this, but that this should only come as part of a wider reform of the service. The report added that labour relations needed to improve, that levels of trust and cooperation between managers and workers was low, and that industrial action took place too often. The study by Mr Hooper was commissioned by the Department of Business, Enterprise and Regulatory Reform (BERR). 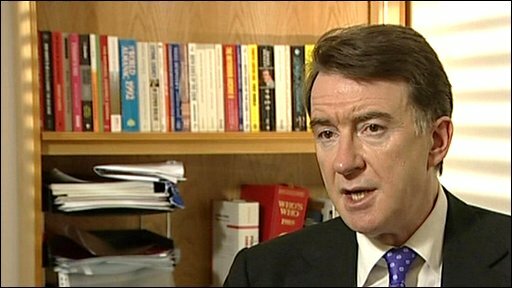 Lord Mandelson said it was vital the suggested changes took place. "I believe that Royal Mail and the postal market can thrive in the future - provided that decisive action is taken now," he told the Lords. "Without far-reaching change, the opportunities brought by technology will become overwhelming threats." However, Lord Mandelson later told the BBC's political editor Nick Robinson the privatisation of Royal Mail would not go beyond the part-privatisation proposed. He said: "It is my view that what we want to see is a Royal Mail sustained in the public sector able to do a job not only here in Britain, but also to become a international player in postal services as well." Meanwhile, up to 2,000 postal workers are to stage a 24-hour strike later this week in a row over office closures. The Communication Workers Union said its members in Liverpool, Coventry, Stockport, Oxford, Crewe and Bolton would walk out on 19 December - the day before the last Christmas posting day for first-class letters. Tories welcomed the recommended part-privatisation of the Royal Mail, calling it a "step in the right direction". However, shadow business secretary Alan Duncan accused ministers in "raiding [Royal Mail's] pension fund to bail-out government borrowing." "We broadly welcome ministers' intention to introduce a new commercial partner... but the details remain unclear," he added. Private UK mail operator DX Group said in a statement: "We would support moves to secure an injection of private capital into the Royal Mail only if this will encourage it to behave in a more commercial manner and adopt commercially-sustainable pricing models in each of its business areas." Meanwhile, the Communication Workers Union, which represents most of Royal Mail's workers, said that private capital was not the solution to Royal Mail. At the same time, the union welcomed proposals for the taxpayer to reduce Royal Mail's pension fund deficit.